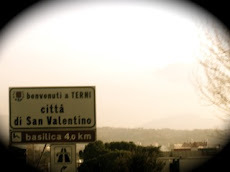 Toronto to Terni: My first ramble. I'm finally ready to write about my recent negative experience here. I haven't really written about these types of things so far because well, mostly I'm too lazy and honestly, it requires quite a bit of energy to complain about stuff. But now, I'm finally compelled to share the shi*tty feelings I've been having because....it's honest. Overall, I'm happy to be here. Most of the time, I feel extremely lucky to have had things fall into place so easily...so far. Then there are times where I'm completely frustrated. Not only do I live in a foreign country, but I went from living in a cosmopolitain city of about 2.5 million to a small industrial town made up of 150,000 people. Obviously there's some adjusting to do. As many other expats have expressed their frustrations with Italian bureaucracy, crazy Italian drivers or rude customer service, strangely my frustrations aren't coming from the same place. I'm more fed up with the fact that I can't seem to express myself the way I normally would in English. I can't have a meeting with my accountant or visit the doctor on my own (yet). I feel totally incompetent and dependent during these times which makes me so upset. So yesterday, when I had two young women ring my doorbell, instead of ignoring it like I usually do (in fear of not understanding), I decided to answer the door. I wanted to take charge of my life and take one small step towards becoming more independent. Little did I know that this would totally blow up in my face. These two women were from a gas and electricity company. Not having set up my own utilities at home, I was worried when they showed up with their badges and binders full of forms. I immediately thought it was my current gas and electricity company coming to check on our meter. After seeing their logo, I asked if this was a different company, and instead of a straight up "yes", I got some kind of run-around response leading me to assume they were a "subdivision" of my current company. I said several times that my Italian is not that great and that they can return later when my boyfriend came home or feel free to leave me something in writing to show him. I even went as far as saying, "I'm not sure because utilities are so different where I come from". But for some reason, which I came to realize later, they wouldn't leave. Then my next thought was, "okay, this must be some kind of mandatory visit". I heard words like "request a discount, green energy, savings, completely free, show us your bills to determine if you're entitled", and somehow my mind told me that this was a friendly visit from this "subdivision" who wanted to check my bill to determine whether I qualified for some kind of green energy discount price or not. How did I put that together? My broken Italian and stupid sense of pride told me so. After 15 minutes of them analyzing my bills, drawing up numbers and figures of discounts on a piece of paper, I ended up signing what I didn't realize was a contract. (insert reader's gasp). This is very hard for me to admit since I am always cautious and would never normally sign anything I wasn't sure of, even back in Toronto. In fact, I'm okay with blurting out the "I'm not interested, please go away" line. But during my recent state of mind (let's call it "blurry-slash-stupid"), I thought signing this piece of paper was a great way to prove to myself and to my partner that I am slowly becoming independent enough to do stuff like this. I will admit, this was mostly my own fault for signing something that I was not sure about. Obviously, under no circumstances should anyone sign anything that they aren't fully comprehending. Stupid me. Incase you are wondering, I actually asked in Italian, "Is this a contract?" after which one woman replied, "No, it's simply a free request to see if you qualify for savings". And in my opinion, I strongly believe that these women didn't leave because as soon as my door opened, they saw my face, heard my broken Italian and decided to take advantage of the fact that they could scam me into signing what was actually a contract to covert over to their gas company (which is a completely separate entity). This contract was a request to be approved, so that once approved, we would be locked into a "discount" price for two years (which I'm still not even sure is a true discount). While I do believe those women should have left the minute I told them I don't understand very well, I am mostly upset at myself for letting my emotions overpower my common sense. What I learned from this experience is 1) don't open the door if I'm not expecting anyone 2) if I do ever decide to open the door, don't sign anything 3) be more patient with myself and less patient with door-to-door salespeople. Oh and, thank God for laws that allow us to withdraw from this agreement within 10 days. So upsetting! I'm like you, I never open the door when I'm home alone. For one, I'm afraid I won't be able to communicate properly, and two, old habits die hard ... in the States I lived in one of the cities with higher crime rates. I've also been having an issue lately of feeling like I don't have a voice here. We go between English, Italian and Arabic. I feel like I can never express myself clearly, and am never quite heard properly. Forget even trying to be witty or sounding intelligent. So frustrating! Otherwise, I hope all is well. Keep in touch! I just came across your blog and I relate to this post, especially (that and wanting A/C....LOL) I live in Firenze, and my first 2 years here I never ever answered the door for fear of having to speak (as I couldn't very well, and understanding was even more difficult)Never mind respond to unknown numbers on my cell! The phone? no way. It's now been 4 years and I can say I'm nearly fluent. The only thing I can't suggest enough is finding a good Italian teacher/course. I attended 3 times a week for an hour with a small group, then down to one 1.5 hour private lesson/week. It really helped me make sense of the grammar and practice speaking and listening in a 'safe' environment. When I met my boyfriend I insisted we only speak Italian, and that has helped well after I finished my lessons. People say I know the 'lingua parlata' better than I probably can conjugate verbs from memory and such, but that's what I want! lol. Anyway, I'm just saying I can relate and it WILL get easier.